There’s a wonderful moment early in Manglehorn—you can see it in the trailer; someone liked it so much that they stuck it in there even though it has no story function—in which the title character, A.J. Manglehorn, hears a noise on the street and puts on his glasses so he can see what the deal is. Except his glasses are already perched on his forehead, and he has tools in his hands, so he just wiggles his eyebrows slightly, dislodging the spectacles so that they drop into place onto the bridge of his nose. Gestures that precise are rare in movies, and they’re rarer still, at least over the past couple of decades, when the actor in question is Al Pacino. After a long period of tiresome bluster, however, Pacino has finally started acting again, which is cause for celebration. It’ll be real cause for celebration if/when he also starts picking projects worthier than The Humbling, Danny Collins, and now Manglehorn, all of which see him struggling to find moments of truth within a contrived, borderline ludicrous scenario. Just the name Manglehorn suggests some desperation on the part of first-time screenwriter Paul Logan. A locksmith by trade, Manglehorn (Pacino) spends most of any given day either alone in his shop, cutting keys for the very occasional customer, or alone (save for a cat) in his dilapidated house, where he keeps vanishing into a back room that remains strategically unseen until it’s finally time to reveal the backstory. Manglehorn also has an extremely strained relationship with his adult son, Jacob (Chris Messina), whose success in the financial world comes across as an affront to this committed small-timer. The one regular joy in Manglehorn’s life is his weekly visit to his local bank, where he lets other customers go ahead of him in line to ensure that he winds up at the window of a particular teller, Dawn (Holly Hunter). When he finally works up the courage to ask Dawn out, she seems genuinely thrilled to accept; their date is a disaster, though, and it’s only then that the degree to which Manglehorn lives in the past becomes clear. 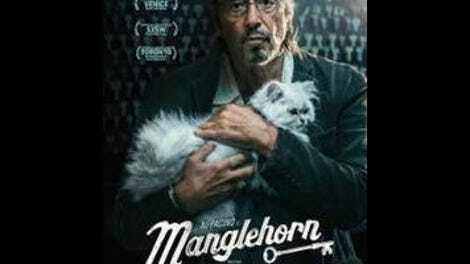 Directed by David Gordon Green, Manglehorn seems designed as a cousin to his previous film, Joe, another downbeat character study featuring an unusually low-key performance by an actor known for going way over the top. 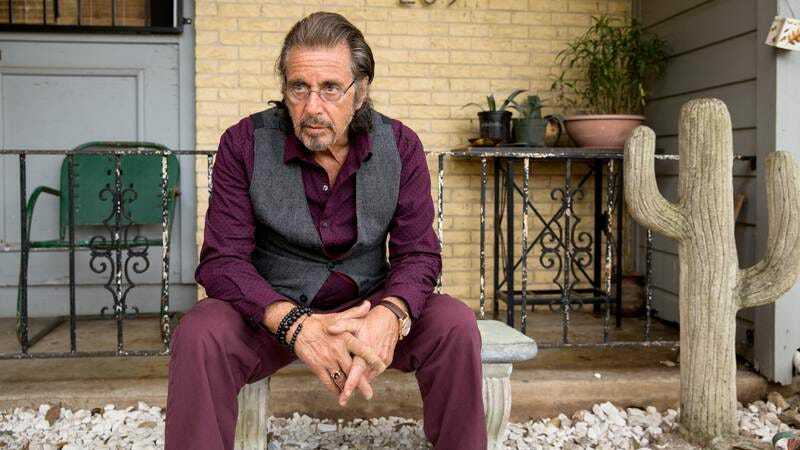 Early scenes focusing on Manglehorn’s job, as he (for example) assists a mother whose kid has locked himself in the car, demonstrate an appealing naturalism, and Pacino’s rapport with Hunter, during their courtship phase, rivals his spiky duet with Annette Bening in Danny Collins. As the film goes along, though, it starts getting goofier, and not in a good way. Harmony Korine, the director of Gummo and Spring Breakers, shows up in an obnoxious supporting role as the owner of a sleazy massage parlor he keeps trying to get Manglehorn (who’d coached him in Little League years earlier) to visit. There’s an homage to the famous traffic-jam sequence in Godard’s Weekend, which seems like little more than a shout-out to cinephiles. Worst of all, that looming backstory involving the unseen room in Manglehorn’s house eventually swamps the narrative, turning Manglehorn into a maudlin redemption tale. With a name like Manglehorn, and an actor like Pacino, there’s no need to turn the cheap pathos up to 11.